A piece of Mars is coming to Orkney for this year’s Orkney International Science Festival. It is a little piece of a meteorite whose structure shows that it was once part of a rock on the surface of Mars. So far, about a hundred pieces of the Martian surface have come to Earth as meteorites and have been found in various locations around the world. These rocks have been assigned to five main groups, according to their compositions. The groups are ALH 84001, NWA 7034, shergotittes, nakhlites and chassignites. 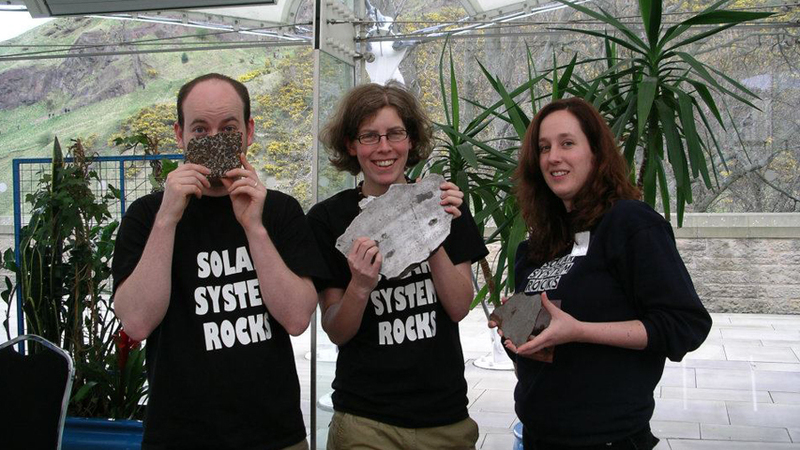 For the Science Festival this year we will bring to Orkney a sample of the Martian meteorite called MIL 03346. This meteorite was found at Miller range, Antarctica, in 2003. Its total collected weight was 715 grams, and the piece we have at Glasgow University weighs 3 grams. It is on loan from NASA to use for our research at Glasgow. The MIL 03346 sample belongs to the nakhlite group, which probably crystallized about 1.3 billion years ago from a single lava flow/sill on Mars. Impacts are thought to have broken up the lava, producing fractures in the rock. Although Mars is dry today, it was a wet planet in the past, and at some point within the last 0.67 billion years water flowed through these fractures. The water is thought to have partially dissolved the rock and precipitated carbonates, clays and salts. By studying these alteration minerals that have been formed through the interaction with water, we can get key insights into the past Martian fluid reservoirs (hydrosphere) and potentially the ancient atmosphere of Mars. The main composition of the unaltered nakhlite rock is a mineral called pyroxene, and it also has occasional crystals of olivine present. The spaces between these grains are filled with a glassy material, which is the last phase that formed from the lava and is called mesostasis. The research of one of us (Tim Tomkinson) involves looking at the formation of alteration minerals in these Martian meteorites called nakhlites. Tim is also working on trying to determine how long ago liquid water was present on Mars, by using the argon-argon isotopic dating technique. Argon-argon dating is a technique for calculating how long ago a geological event took place, particularly the eruption and cooling of igneous rock. It is based on the way in which radioactive potassium-40 decays over time to stable argon-40. A small amount of a rock sample is crushed up and irradiated with neutrons from a nuclear reactor, which turn the stable form of potassium in the rock (potassium-39) into radioactive potassium-40. We will also bring meteorites that come from asteroids. These samples are loans from the Hunterian museum in Glasgow. 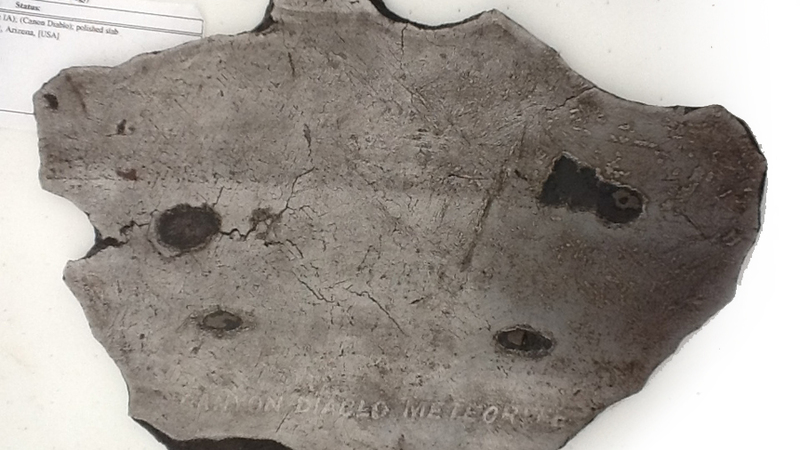 For example, we will have a large polished section of the Canyon Diablo meteorite which is an iron meteorite, believed to have come from the core of a large asteroid. Canyon Diablo fell to the Earth about 50,000 years ago in Arizona, USA, and pieces have been known and used by prehistoric Native Americans. Asteroids are ‘leftovers’ from the building blocks of the solar system that formed around 4.56 billion years ago. Liquid water was present on some of these asteroids very early on after their formation. A better understanding of how this water system worked can be gained by studying alteration minerals in carbonaceous chondrite meteorites. Carbonaceous chondrite meteorites are the oldest rocks in our solar system, and they act as archives for very early solar system processes. Dr Tim Tomkinson and Dr Paula Lindgren are both researchers at the University of Glasgow and their research is funded by the UK Science and Technology Facilities Council (STFC). Tim’s research involves looking at the formation of alteration minerals in these Martian meteorites called nakhlites. Tim is also working on trying to determine how long ago liquid water was present on Mars, by using the argon-argon isotopic dating technique. Paula’s research is on carbonaceous chondrite meteorites, which are rocks originally derived from asteroids.